"I think it's fabulous," said veteran learning expert Susan Schwartz. I've interviewed Susan many times before but I clearly detected a different tone in her voice when I spoke to her about Morphology Jr. All the games in Toys are Tools are special and different and smartly designed but this game... this game really deserves special recognition. 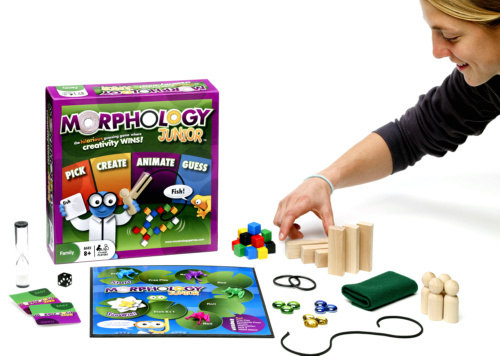 In Morphology Jr., you are given a set different objects, wooden people, a string, cube blocks, glass beads, wooden blocks, and rubber rings. Players just take pick a word from the deck and then using the pieces, try to get their partner to guess the word. There is a timer if you want to use it. You may recognize this concept but I'm serious when I say that this is not Pictionary with some random twist. It's simply in a class by itself. The first awesome quality I noticed about Morphology Jr. was how players are really encouraged to take another person's perspective. 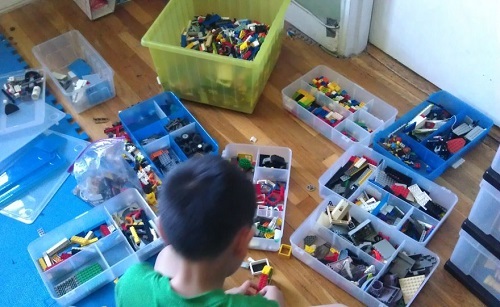 As a mother, building up this skill is a top priority for my kids. Susan thinks it's important too, especially in this game. "Perspective-taking is crucial," she said as she pointed out how one approaches this spacially, socially, and emotionally. For example, spatially speaking, I could tell that my kid would benefit from this game when I saw that he was showing me something that I was supposed to guess (a whale) but the whale was UPSIDE DOWN! (Facing him, not me) See short video below. However, I should note that players are also practicing perspective-taking socially and emotionally and that is really important to Susan. “It helps build empathy,” she said. “It helps build taking someone else’s point of view, which we do when we’re reading, when we’re studying history…” -Susan Schwartz, MAEd, on perspective-taking. Susan and I always talk about flexibility. As a mom, this is another huge priority in terms of skill-building goals I have for my children (and the Husby too.. shhhh…) I noticed that my son would read the word, then start making the clues but when I wasn’t getting it, all he did was continue to point to his clue. He didn’t add to or change his clues. When playing with her students, Susan would advise them by saying, “I’m not getting this clue, you have to give me something else.” I would prompt my son to do the same and he would but if I hadn't asked him to be flexible, he might have continued to fruitlessly point to his clue. In fact, one of Susan's students remarked on this very point, "'This game helps you to think hard about how to give good clues,' he said. 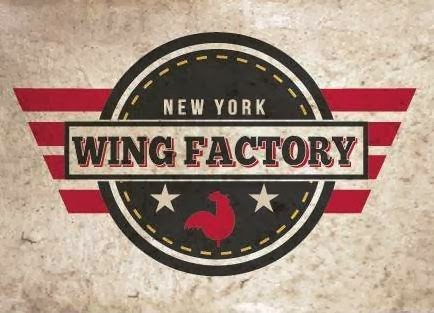 I thought that was fabulous," Susan pointed out. The words “unleashes creativity” is thrown around as randomly and as frequently as the word “educational toy” is. What I love about the readers here is that y’all can’t be fooled. Some toys are more “educational” than others. 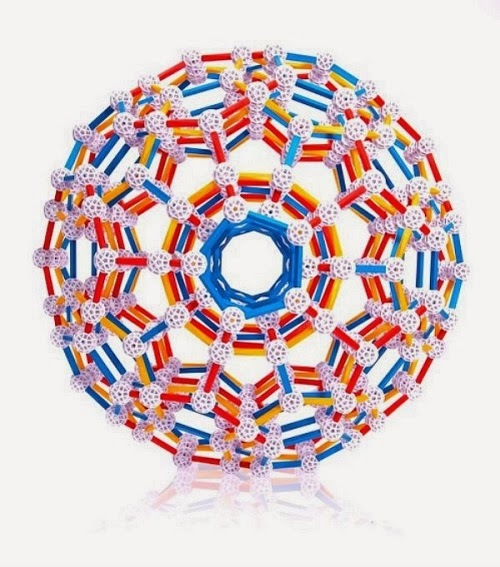 Things labeled as "creativity toys" do not phase us anymore but …. And this is a big BUT here… Morphology Jr. does an image makeover for the word, “creativity” in the world of toys and games. I feel like I know lots of creative children and that sort of puts me at a disadvantage when trying to gauge the creativity factor in a game. I wondered if anyone really knew kids who weren't creative. Susan said, “I know lots. 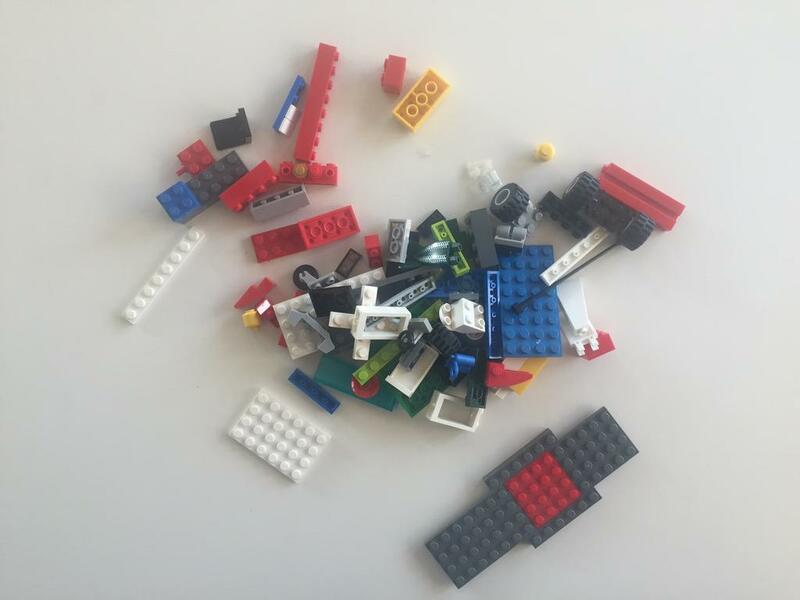 They think about things in a black-and-white, simple way.” However, Susan also said that Morphology Jr. forces kids to think about the symbolic way they’re using the pieces. “That’s very creative. It’s abstract.” Learning to think abstractly is very important for children. Really? Why? “Every subject that we study, we are making models of what the real world looks like,” Susan said emphasizing how kids are drawing conclusions or making an inference based on the information they have gathered and not just by what they see. All in all, Susan said it helps our kids be good problem solvers. One thing you might want to know is that the game board is smaller than most other game boards. Susan and her students thought the game board could be bigger but I had only played the game strictly with a timer and so I found that advancing toward the finish line did actually take some time despite the size of the board. Additionally, I hate when my kids fold game boards the wrong way or if the board gets tattered at the fold. That can't happen with Morphology Jr. Regardless, we both loved the objects included in the game. "They are really lovely," Susan said. I love the choices that the inventor gave us to use to make the best clues for our teammates. 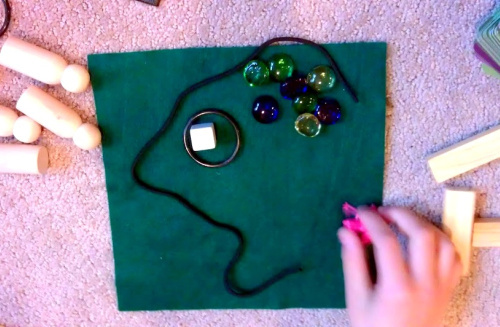 It should also be said that Morphology Jr. can be played in many different ways. The box says 4 players and up but that is just one way to play. This game actually gives you other suggestions on how to play and those can use less people, more skills... you decide. Both Susan and I loved that. 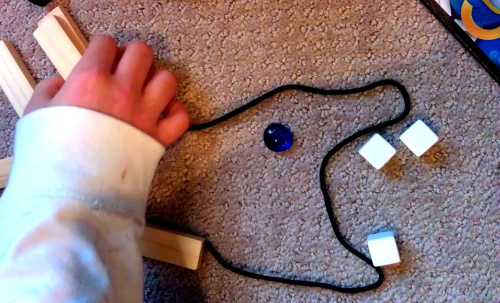 If you are a therapist or teacher, you will find many uses for this game. What is even more fun is that Morphology Games Facebook page is always running little guessing contests for fans to guess photos and win a free game. Maybe your children will be the next to submit or guess the correct answer! Thank you folks at Morphology Games! Yours is a gift that keeps on giving! 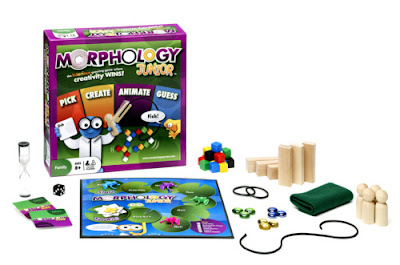 Now it's time to win your choice of Morphology Jr. or Morphology Original! This giveaway can be shipped to Canada and the U.S. and it ends on 1/9/12 12:01 AM. Remember to please follow the rules! Can't wait to see if you won? Buy it through my Amazon link! However, right now, I can see that you can receive a free ship code off their site if you LIKE the Morphology Games' Facebook Page, click here. and click here to check out their current contest. Additionally, if you want their newly released expansion pack, you can purchase it at Marbles the Brain Store. I have never heard of this game before. I was reading about your ThinkFun games which I love. So if you are recommending this game I would love to give it a try. We are a family of 7 always looking for different and fun games. I had never heard of this game before, but it looks awesome. I love any game that helps use imagination and thinking! we bought several of the Nano Block instrument sets for Christmas presents this year. and I have my eye on some Sifteo cubes that I can hopefully get with Boxing day sales. Thanks Jen for such an amazing year of toy reviews! I always look forward to your posts, even if I haven't had the time to come back and comment. Keep up the great work!! 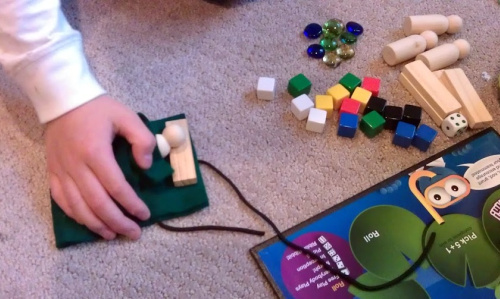 After reading this blog, we purchased some SmartMax, the Roll and Play (although I think you reviewed that on a different blog), Tegu, Yackety-Smack. And I think that's it so far. Thanks so much for the kind words and for letting me know what you purchased. It's great feedback for me! thank you so much for telling me! what great feedback! It's hard to know how useful these reviews are to you all! Oh, and what is Boxing Day? That must be Canadian? I love how Canadian say Pencil Crayons instead of Colored Pencils (U.S.) BTW, I will be writing about Sifteos next week! I've purchased a few ThinkFun games this year and I plan to buy Sleddy kites in the spring. Qwirkle is on my wishlist. I love that it teaches perspective. I checked out one of the pictures on their Facebook page and it was interesting to see how many different answers there were just for the one picture. Sort of reminded me of commenting on a child's drawing that they had drawn a nice dog only to learn that it was really a horse. i have not actually puchased anything after reading your blog, but i am eying a few games, and i am absolutely INSPIRED every time i visit here. i have never heard of this game before but it sounds awesome. I've heard of it, It sounds fun. Nothing, cash has been even tighter this year. Have bought some Thomas toys since finding your blog but you gave me some ideas for an upcoming birthday. Had never heard of game before but I love the creativity involved. We purchase very very games and toys here due to budget constraints, but have enjoyed some we have won from Toys R Tools such as the whisper phone, lab mice game and paints. One toy Santa brought was inspired by the magnet vehicles we saw on Toys Are Tools, but was from a different maker, I think.